BAITHIN (COMIN, COMINUS), St. Baithin is traditionally believed to have been a cousin of St. Columba (vide infra) and his successor as Abbot of Iona. He reposed on the anniversary of St. Columba’s repose circa 598. 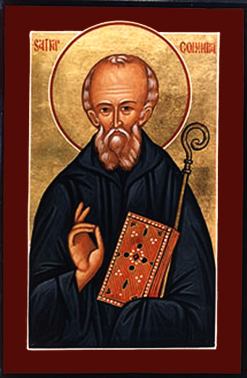 COLUMBA (COLUM, COIM, COLUMBKILL, COLUMCILLE, COLUMBUS, COMBS), our venerable and God-bearing Father Columba of Iona, Enlightener of Scotland, was born near Garton in Co. Donegal, Ireland. He received monastic tonsure at Glasnevin and was ordained to the priesthood. He was instrumental in the founding of monasteries at Derry, Durrow and several others. Following the Battle of Cúl-drebene (561), for which he was held partly responsible, he, along with twelve disciples, sailed from Ireland to Scotland, landing on the Island of Í Chaluim Cille (Í of St. Columba) variously spelt Hi, Hy or I, now called Iona. There he founded what would become the great monastery of Iona, which was for the next two centuries, the nursery of many Bishops and saints. St. Columba spent the next thirty-four years evangelising the Scottish Highlands and founding monasteries and churches in Ireland and Scotland. St. Columba reposed on Iona in 597, and was initially buried there. His relics were later translated to Ireland where they are reputed to be buried in Downpatrick, Co. Down, with St. Patrick (17th March) and St. Brigid (1st February), or at Saul Church, neighbouring Downpatrick. St. Columba is counted as one of the three apostles of Ireland, along with SS. Patrick and Brigid. In addition, St. Columba is also the source of the first known reference to the Loch Ness Monster. According to legend, he came across a group of Picts who were burying a man killed by the monster (circa 565), and brought the man back to life. In a different version, he is said to have saved the man while the man was being attacked, driving away the monster with the sign of the cross. An apostle to the heathen and an indicator of the Way of salvation. CUMMIAN (CUMIAN, CUMMIN), an Irish bishop who resigned his (unknown) See to live as a simple monk at St. Columbanus’ abbey at Bobbio in Emilia-Romagna. St. Cummian was an avid supporter of the Roman versus Celtic method of calculating the date of Pascha. While at Bobbio his reputation as a man of great sanctity spread far and wide. St. Cummian reposed either 661 or 682. 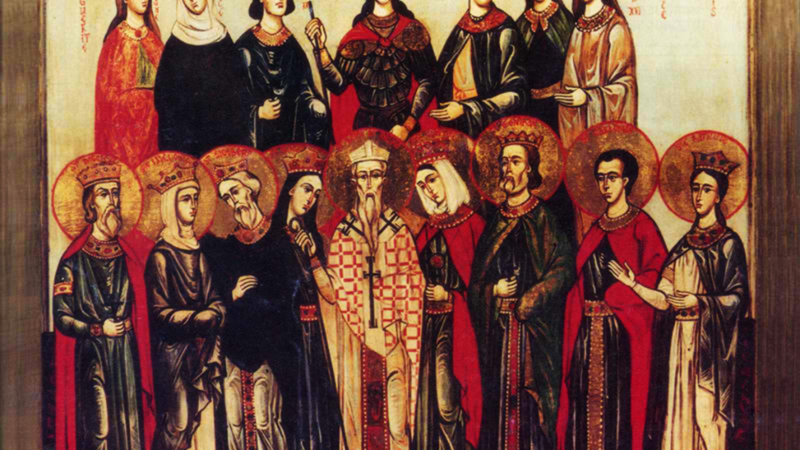 PRIMUS and FELICIAN, two elderly brothers martyred during the Diocletianic Persecution (303 – 313). Their unreliable acta and other legends claim they were scourged, or thrown to lions, or tortured and then beheaded, all of them do agree they met their end on the Via Nomentana in Rome. VINCENT of AGEN, a deacon who was spread out and staked to the floor, after which he was scourged and then beheaded, some sources say as a sacrifice to a pagan god. His martyrdom took place at Agen in Gascony circa 292.